Pixar Animation Studios has produced many of the smash hit children’s movies over the last two decades including Up, Monsters, Inc., Toy Story, Cars, WALL-E, and Finding Nemo. Despite the abundance of recognizable and beloved characters from these movies that could serve as Pixar’s mascot, their mascot is a nod to their earliest forays into the world of CGI. In 1986, a fledgling Pixar released their first film, Luxo Jr. The short film, a scant two minutes long, features two Anglepoise (balanced-arm) desk lamps and their curious interactions with a simple rubber ball. The film was intended to showcase Pixar’s technical capabilities and included the use of rendered lighting effects, shadows, surface shading, and other cutting edge CGI effects of the day. The film received an Academy Award nomination for Best Animated Short Film (and was the first CGI film nominated for the award). 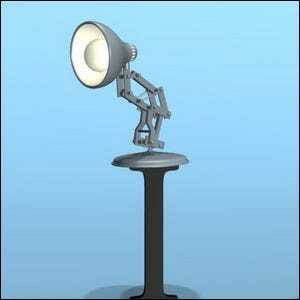 Luxo Jr. went on to serve as the mascot for the animation house and appears at the beginning and end of every film in the Pixar logo sequence. In the default sequence, Luxo Jr. comes out, checks on the logo, jumps on the “I” in it, and then stomps the “I” into the ground before shining his light at the audience. Movies often have custom sequences incorporating elements and characters from the film into the sequence with Luxo, Jr. In the WALL-E sequence, for example, Luxo Jr.’s bulb burns out and WALL-E comes to the rescue, replacing it with an energy-efficient fluorescent one. Luxo, Jr. isn’t the only thing from Pixar’s original film to make repeat appearances. The small rubber ball (the Luxo Ball) that Luxo Sr. and Jr. play with in the short film has made appearances in almost every Pixar movie since then as a small Easter egg.